Mizuno's marketing pitch: Blur the lines between race day speed and everyday training. Upper: Spacer mesh, synthetic leather, PU overlays. 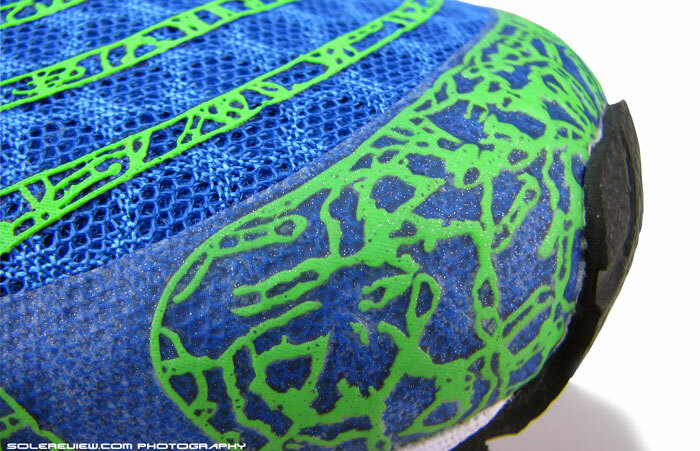 Midsole: Compression molded U4Ic EVA, Pebax parallel heel Wave plate. 10mm heel to toe drop. Outsole: Hard carbon rubber (X10) in heel, combination of fabric mounted grip lugs and softer blown rubber in forefoot. Widths available: Standard (reviewed), 2E (wide). As advertised, the Wave Sayonara 2 is a shoe which takes on race day and daily training duties equally well. Stable ride, responsive wave unit, transition, ventilation, weight. Barely any reflectivity, U4ic foam not responsive as marketed. At times, it is refreshing to do a running shoe equivalent of a speed date. Test it on track, that is. Sometimes, a quick track session will fully coax out a shoe’s character, and within a very short span of time. Especially when the shoe in question is designed for fast paced running – like the Mizuno Wave Sayonara 2, which straddles middle ground between a full blown distance racing flat and neutral trainer. And what makes it so? 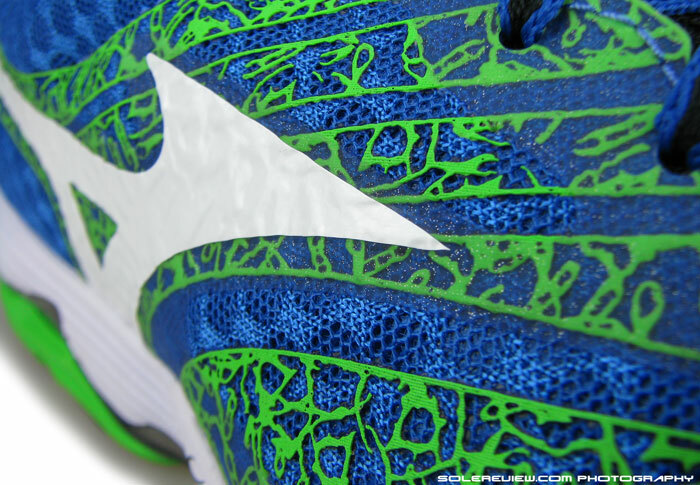 Mizuno says that the Sayonara 2 delivers speedwork in a comfortable and supportive package. We concur. To begin, it is very lightweight without looking the part. 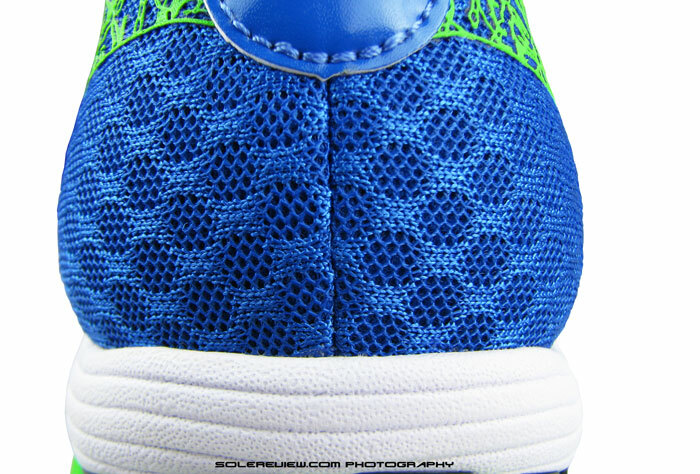 We mean, look at the parallel Wave plate in the heel. It cuts no corner on volume, making the stack heights look close to what’s on regular runners. The Sayonara 2 heel isn’t exactly pancake flat, putting out a 10mm drop on a stack of 24mm. The midsole’s a piece of compression molded EVA foam, which logically should throw its weight around, as is the natural order of things. From a distance, the upper also looks like a busy place to be, with all the overlays mapping the surface. And lastly, throw in plenty of outsole rubber too. And yet, a half pair in US size 11 is mere 9.1 Oz (259 gms) light, placing it well within the boundaries of the distance running shoe median. For comparison’s sake, that’s full 41 grams under the Mizuno Wave Rider 18. The key to its weight management can be attributed to design balance; be frugal yet clever with upper construction, and thus create greater leeway to pack in more stuff where it matters. Two-thirds of Sayonara’s forefoot is covered with race specific lugs. Increases grip, and cuts down on weight. Small rubber levers and lugs are mounted on a fabric base. They look like computer circuitry, or even Canapes, if you stretch your imagination. So where were we? Ah yes, back to the track part. Two traits of any shoe will quickly come into their own during a track workout. 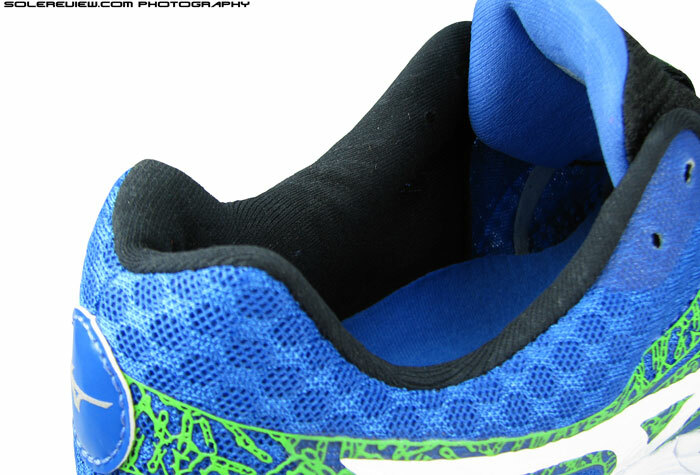 First is the front end outsole grip, and second is upper fit. The first one was of particular interest on the Sayonara 2, with the forefoot section featuring road racing specific outsole. By which we refer to the section with small pieces of rubber fixed on a mesh base. 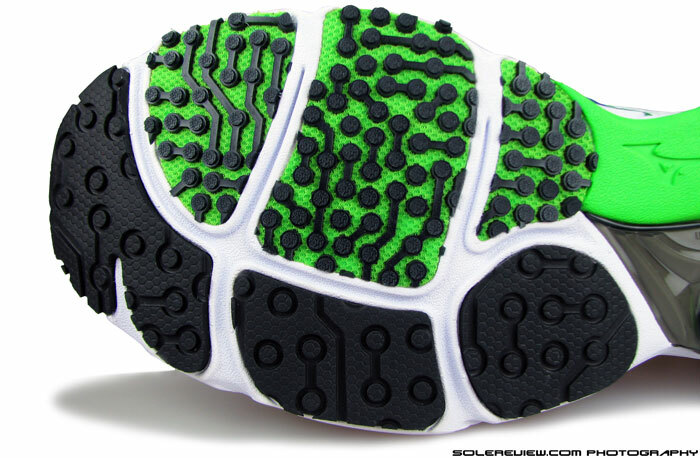 This design, which visually looks similar to a computer circuit board (or Canapés, if you’re culinarily minded), reduces weight while delivering superlative grip on surfaces. That said, the Sayonara 2 restricts latter’s frontal coverage, with around 2/3rds of forefoot featuring this lightweight construct. The remaining lateral side is layered with traditional looking slabs of blown rubber. The compromise makes sense, given that most of the transitional forces will be concentrated in that area. Mixing in blown rubber also provides more durability than in a scenario where the entire forefoot features a Canapés-ish outsole design. This translates rather well on the track. Forefoot grip is good on straights and curves alike, though the experience is a cut below a shoe like the Adios Boost, which felt more linear and accurate. Within this category of running shoes, we’d award the Sayonara a place between the Adios 2 Boost and Nike Zoom Streak 5, with adidas being more focused and Nike being more easy going. Upper forefoot fit is actually relaxed, more on the lines of Wave Rider 18 and Nike Zoom Streak 5. This makes the Mizuno a lesser track tool, as the upper fit dilutes the explosive, focused levels of push-offs you’d wish for on a track. It is far from blunt, yet not optimal for maximal track sessions. But what’s found wanting on shorter track workouts doesn’t necessarily hold true for road running; much in the way like a racecar which can corner fiendishly well on track, but will have little going for it on long and straight interstates. A relaxed upper is likely to be a more desirable aspect, as it actually helps the rigors of distance running. A lot of runners might look for a snugger forefoot to help them put on ultra fast miles in shorter races, but then there are plenty of other shoes which cater to that need. In a running shoe category populated with all pervasive snugness, the Sayonara 2 and Zoom Streak 5 make for an equal (and somewhat uncommon) pairing, given their fit character. This is a shoe which will please you if adequate foot splay sits high on your wishlist podium. Forefoot fit is relaxed, roomy, plenty to go around for foot splay. Tongue is padded, soft and spans wide. The Sayonara’s upper is a comfortable place to be in. 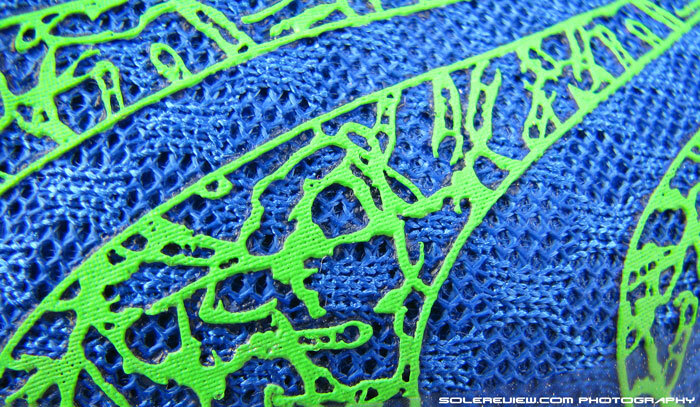 It is made of a single piece, lining-less mesh which is breathable and pleasant to touch. The tongue’s a softy-soft piece of work, spacer mesh on top and a smooth fabric on the business side. It’s pack-stitched with foam and wide across, which means it provides great coverage over foot instep, and minimizes tongue slide while at it. The lining is smooth, but then you have these support/structural underlays. Not a cause of concern with socks. If you go barefoot in the Sayonara, these will make their presence felt without chaffing. Not a sock-less deal breaker in the way Wave Rider 18 was. You can wear the Sayonara 2 barefoot, but be mindful of these support strips on the lining, which help give the minimal upper its shape and eyelet panel reinforcement. While these strips are nowhere as bad as the ones on Wave Rider 18, their presence is felt inside nonetheless. With socks, these don’t do any harm and blend right in. 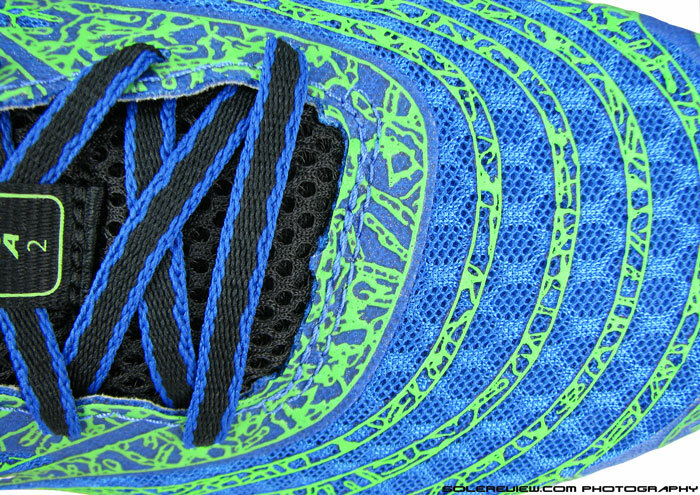 The asymmetric lacing frontend opens up space over lateral forefoot. Forefoot fit, as pointed out, is relaxed on either sides. Note that the lacing starts with an asymmetrical sideways skew, opening up some lateral room. Toe box height is just right, feeling neither cavernous or shallow. Heel to toe sizing runs true. Sides of lower heel have a noticeable outwards flare, so they don’t close in tight on your foot base. Collar is Mizuno standard mesh and foam, with hard to see fabric texture. There are these vague outlines of patterns. Achilles dip is soft, and one wished the internal foam padding was a little more sorted out. The top curve is hard and tends to rub over. A few break-in runs alleviates this. Upper heel mimics the fit overtones of Wave Rider 18. This has the collar closing in on the foot with a medium level of snugness, and lower part is relatively relaxed, much in part due to the molding flare of the internal stiffener. The grip around ankles isn’t found lacking, but leaves you with the feeling that it could be improved with optimal spread and placement of foam padding. 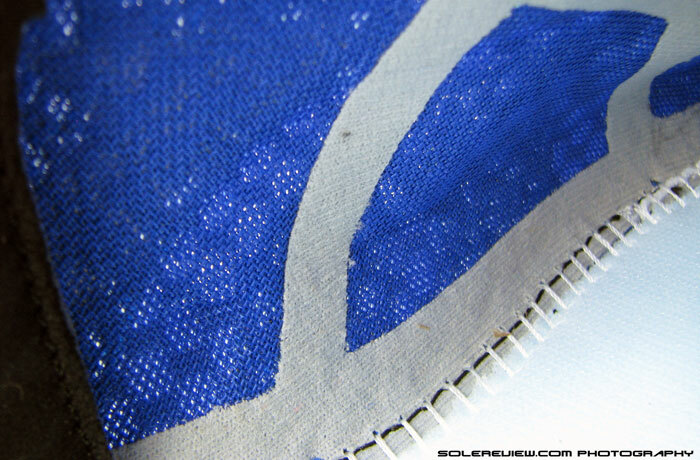 The eyelet curve (where collar ends and lacing begins) is hard, and has a tendency to rub over the foot. This is an issue which becomes less noticeable after half a dozen runs. Sayonara 2 comes fitted with functionally efficient laces. The flat shape helps them sit flush over the padded tongue, distributing lacing pressure over a larger area. And once laced up, they stay that way without coming undone midway. The length’s just right; neither too short nor too long. Polyurethane overlays contribute to aesthetic depth and structural support. Here’s looking at them close. A second layer of transparent, film type material reinforces the toe bumper and other parts of the shoe. Weight reduction is achieved by a variety of means, the chief ingredient of that being the use of PU upper overlays. 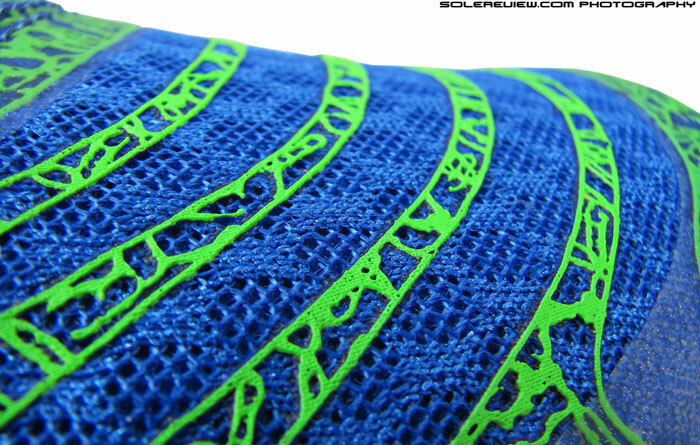 That’s the green, curvy strips going over the upper, which have the look and feel of high density printing. Atop that, there’re secondary layers of barely visible, translucent fused-on material. 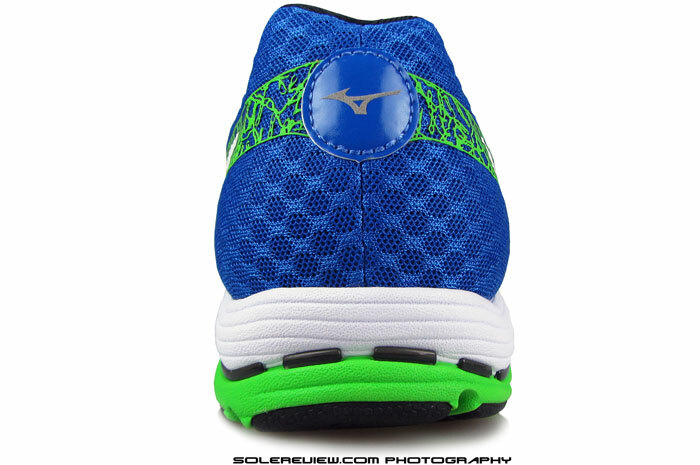 These filmic overlays go over the toe bumper, forefoot sides, under the white Mizuno logo and over the eyelet panel. 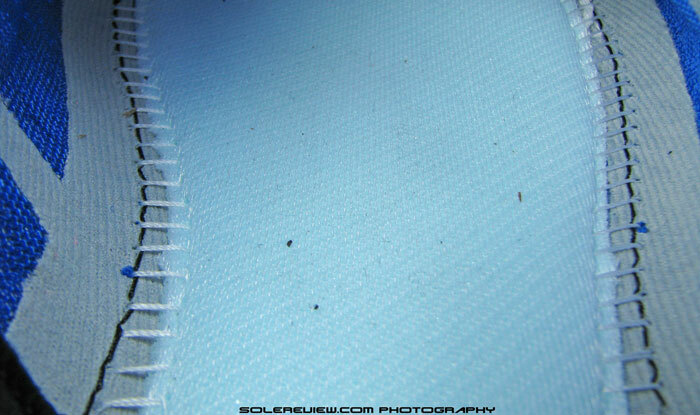 Eyestay has external reinforcement in form of the transparent fuse-ons, and then another strip of fabric on the inside. Nary a synthetic leather overlay on the Sayonara 2. There’s a near-complete absence of stitched-on, synthetic leather panels on the upper, except on the heel. A circular, quarter shaped patch of synthetic boasts of what is the Sayonara’s only reflective piece, a la Rider 18. The upper construction and materials have a significant bearing when it comes to keeping digits low on the weighing scale, and allows for the well endowed sole area. Because for what the shoe is, the bottom packs in a lot. 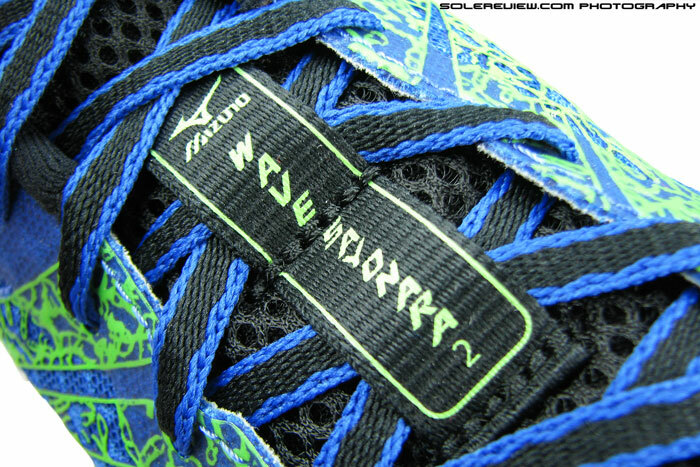 The Mizuno Wave Sayonara 2 uses a compression molded EVA (Ethylene Vinyl Acetate) midsole, branded as U4ic. Dual colored midsole with Wave plate in between. The white and green foam appear to be of equal density; the green foam extends inward under midfoot. 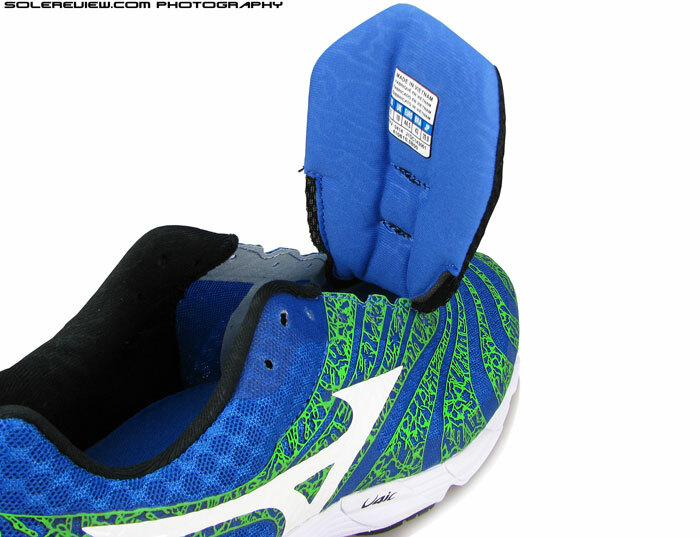 Midsole is made using two pieces of compression molded EVA , which goes by the Mizuno bestowed U4ic name. The white part is a heel to toe, single piece of molded foam. Move to the rear, and the second piece of green EVA lines the bottom, with its medial part extending to midfoot. Can’t really call this a dual density arrangement though; regardless of different colors, both foam units feel the same in hardness. A parallel Wave unit is locked between the white and green foam section. It is a true ‘parallel’ design, with the crests (rise) and trough (dip) of the Wave unit being consistent across lateral and medial sides. We thought this was worth highlighting since the Rider 18’s ‘parallel’ wave wasn’t exactly so, with its lateral side being more subdued (and hence pliable) than medial side. 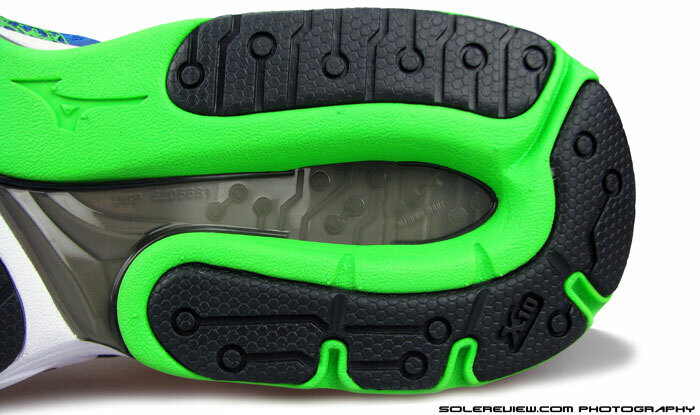 The outsole packs a lot of tread, with large X-10 pieces in rear and race-lug+blown rubber in the front. As far as the outsole is concerned, Mizuno’s hard X-10 carbon rubber is underlaid rearfoot in a horse-shoe shaped pattern, and when you move forward, that material changes to softer blown rubber on lateral side. The star of the show is of course, the network race specific lugs situated medially on a fabric base. Mizuno has the formula for insole top cloth perfected. Smooth, friction free surface. High density, molded EVA foam with perforations. Mizuno describes the U4ic’s ride as ultra-responsive. To that, we see the flowery adjective as the work of an overtly imaginative mind. The midsole foam looks, feels and performs like regular compression molded EVA foam. It is firm and the word responsive would be an incorrect description. However, solace comes in form of the removable insole and the strobel beneath, which elevates cushioning levels of the Sayonara. Strobel below the insole is a padded fabric type. Lift the insole, and it reveals a soft strobel layer with few millimetres of foam inside. The sockliner is comfortable, a perforated dense sheet of molded EVA with a super smooth top cloth. 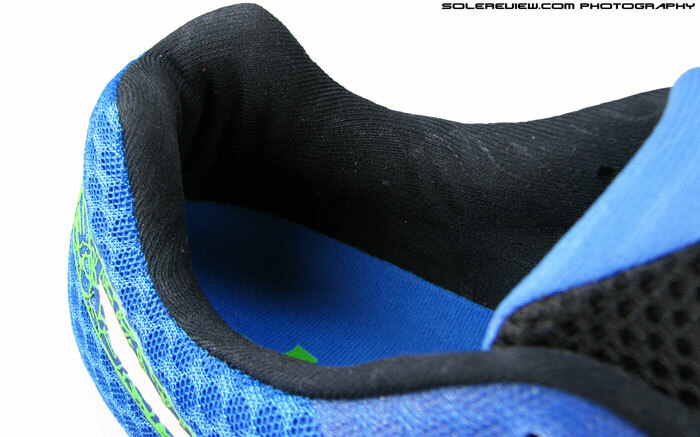 Mizuno has got the fabric material of insoles down pat; the one in Rider 18 felt ultra-luxurious. Here, the Sayonara’s insole cloth might not be in the same silky league as the Rider 18, but comes through as plush enough. 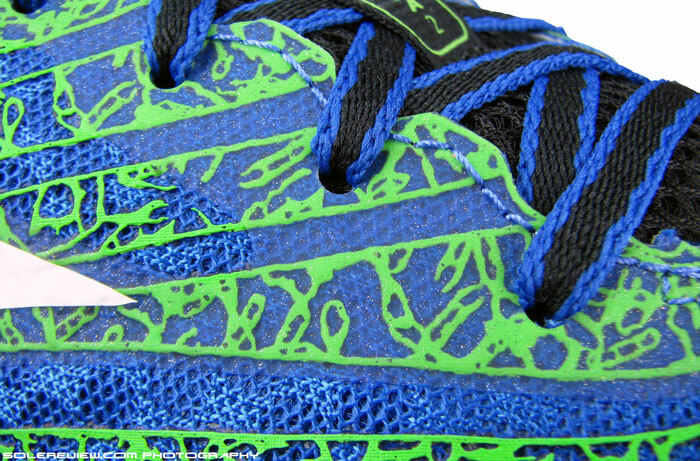 We don’t understand why Mizuno tries to sell responsiveness in a shoe like this. It is almost as if Mizuno see a firm ride as a pariah, staying away even from a mere mention. We think that mindset to be pretty futile. Everyone knows that Mizunos have an unique ride, and loyalists will respect the difference, and many newcomers will embrace it. Especially in a shoe like the Sayonara 2, firm ride is a positive trait; one which helps fast paced running. 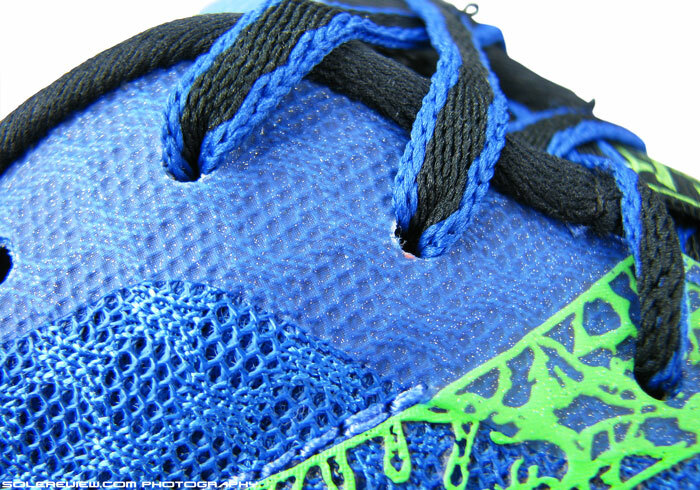 If there’s any responsiveness, that is the result of the heel Wave cushioning. In our Wave Rider 18 review, we observed that thinner the EVA holding the Wave plate together, greater the case for responsive cushioning. Well, that applies in this situation. 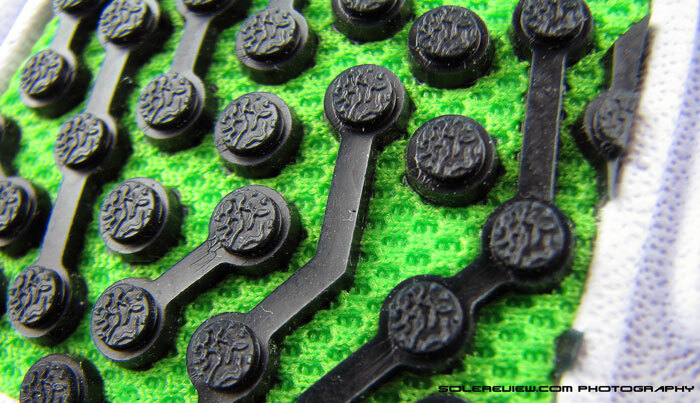 The lower profile foam sections amplify the Wave plate’s rebound properties, making it much more responsive. Now, all this is relative to the Mizuno catalogue, and use of this word is brand specific – not to be mixed up with adidas Boost responsive or Nike Zoom responsive, which are different things altogether. 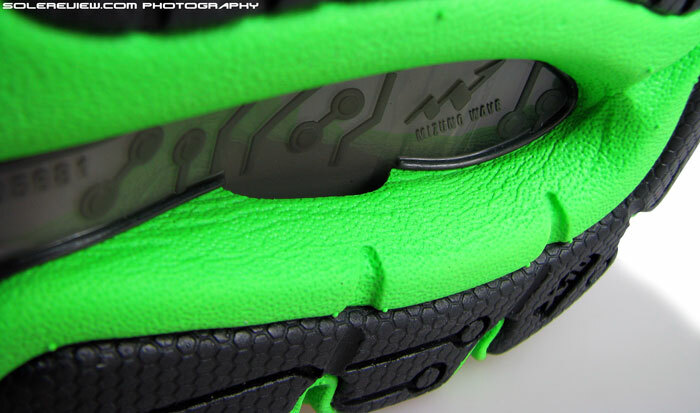 The Wave technology was actually designed to prevent deformation than to cause it, with the end goal being stability. The responsiveness corresponds with increase of input forces, which means faster rear-foot strikes or higher body weight will cause a greater splaying of Wave, and with that, pronounced feedback. Mizunos are not known for their soft ride, so you can practically bid goodbye to that aspect once you sign up for a pair with the Runbird logo. Sayonara, by the way, translates into farewell in Japanese. So there you go. The Wave plate is parallel under rearfoot, and medial side of it extends under midfoot. There’s no lateral bias (unlike Rider 18) in Sayonara’s heel cushioning, as the design of Wave Plate follows parallel symmetry. This makes the shoe a close image of what true neutral behavior should be. Rearfoot strikes are gentle, with smooth transitions. Landings have none of the bone jarring impact of Rider 18, which incidentally uses the same X-10 rubber based crash pad. There’re a couple of reasons behind this. The X-10 is embedded near flush with midsole foam, making landings softer and gradual. Wave plate articulates under the heel, allowing it easier splaying under foot-strike. 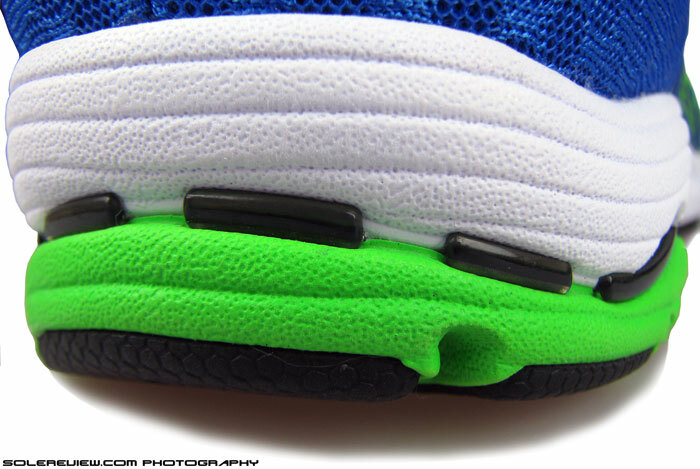 Medium thickness rubber pods sit nearly flush with the green midsole foam which they are mounted on. This allows both the materials to shoulder the burden of foot strikes, as opposed to the hard rubber taking the entire brunt. Also take into the account the somewhat articulated design of the Wave Plate. Towards its heel end, the plastic unit breaks away into separate extensions, affording it a greater freedom of flex when pressure is applied. Outsole heel has a small angle of bevel for transitions; the circular patch on upper displays the only area of night time reflectivity. Transition is smooth, a predictable outcome of consistency in material density underneath, the Wave plate extending far into medial midfoot, and a full contact outsole with slight heel bevel. This is a shoe which doesn’t have much cushioning sink, and the gait cycle feeling economical. 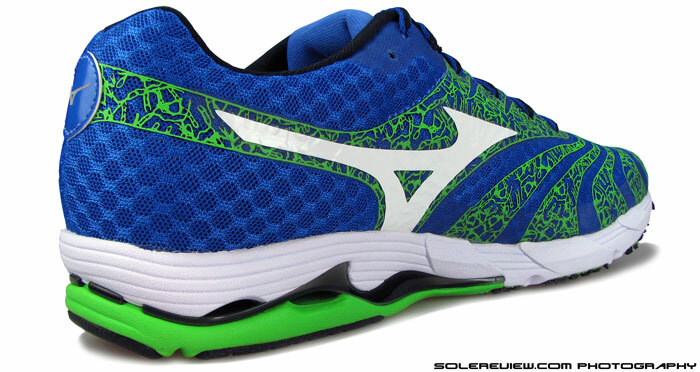 It has good support overall; though the forefoot lacks the slight inward curve we so loved on the Mizuno Wave Rider 18. 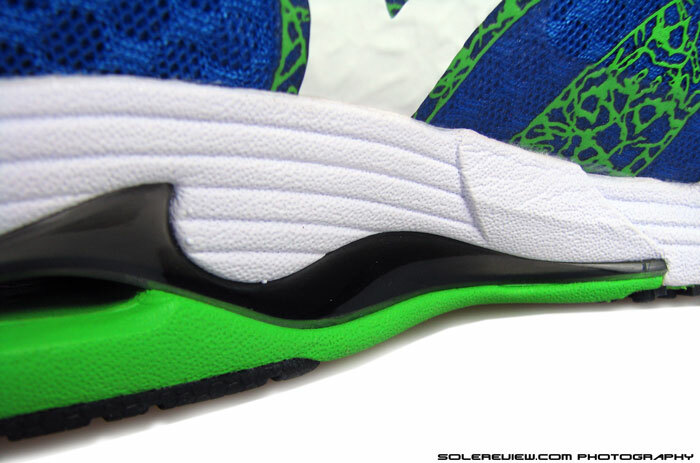 In the Sayonara, the foot sits on top of the midsole and not in it; and we understand why Mizuno kept it that way. Scooping out the midsole would have reduced the midsole thickness which was low profile to begin with, and one might have felt a lot more road than what’s good for most. In the existing set-up, Sayonara 2 balances cushioning with ground feedback well. The Sayonara 2 is great for runners who want a fast ride, but in a lightweight package which does not strip a shoe down to a bare minimum. The shoe is padded well enough while being flexible, and offers an upper which fits and breathes well. Owing to its half-race outsole, durability might not stand up to heavy mileage expected of full fledged trainers, but will fare better than many of the minimal distance racers. Very comprehensive review as is the norm. Please further clarify the following statements. My interest is could a supinator “survive” in this shoe ? Too much stability ? Mizuno listed the Sayonara as a replacement for the discontinued and very popular Precision and Elixir. From reviews, many runners do not find that to be true. I tried-on the original Sayonara and was among those that felt the toebox was too shallow and the shoe was not flexible. Glad that was improved. We read that section in our review again, and boy, do those words sound heavy. We’ll re-write that part sometime this week so that it sounds like English! Mizuno Wave has this corrugation like shape, with the curves rising and falling when seen from the side. In Wave Rider 18, the medial side had a stronger curve than on lateral side. This meant that the lateral side (with its gentler corrugation) had the tendency to compress more under pressure. This created a greater lean on lateral side with each footstrike on the Rider 18. However, that isn’t the case with Sayonara 2. Corrugation on either sides is same, or ‘parallel’. This changes the Wave unit’s footstrike behavior. Can’t say for sure whether these will work for you or not. But as you pointed out, the shoe is very stable (and firm), and if this kind of a shoe hasn’t worked for you in the past, then chances are this one won’t, too. And vice versa. Sayonara 2 uses the same sole unit as Sayonara 1 so flexibility has not improved. We found the flexing to be adequate, with the shoe bending slightly behind the metatarsal area – which works out to be functionally sufficient. Toe box is slightly shallow at the very tip, and we thought it was just right. But again, your experience might differ based on how your foot is shaped. I love the Sayonara 2’s. The best shoe I’ve ever run in. I’m Still in search of the perfect complimentary shoes for easy longer runs. I’m female, 5’2″ 110 and my training focus is on fast 1500m to 5k. This shoe works well for most of my training which is typically on bark trails and soccer fields and track in the spring/summer. I was hoping that the wave rider 18 would be a slightly built up version of the sayonara but am finding them to be too stiff which makes it feel like my foot is getting crushed from the top and sides to the point where I fear it will cause foot issues in the long term so I need to discontinue using them. I ddint mind the firm ride but as you mentioned they are loud as all get out. Thinking of trying the pegasus 31, brooks ghost or launch. I have a normal to wide foot with a little more prominent tailors bunionette on my right foot so I appreciate a roomier forefoot/mid foot. I’d like something that leaves me a little more protected feeling during my road 5k’s and easy bark trail runs. Any suggestions? Good rec by Charles on the 890. The Ghost is a great shoe but you may find it heavy compared to the Sayonara. Check the Brooks Pure Flow in addition to the Peg 31 and Launch. 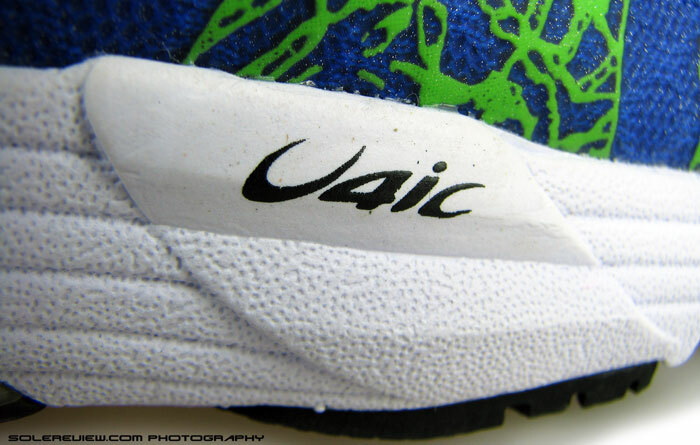 There’s a suggestion about 890 V4’s below – we can’t offer an opinion because we haven’t reviewed them yet. You can consider the Pegasus, spacious forefoot sides (but shallow above the big toe) in its default ‘D’ width. Haven’t tried the Launch, but Ghost forefoot is definitely narrower in the front compared to Pegasus. Also see if you can get to try an older Pegasus 30. It’s a soft roader, but with a roomy forefoot and minimal side overlays. Also thinking Nike Zoom Streak 5. Why? The forefoot has space on sides (though shallow vertically) and side panels are all mesh so less potential of irritating your bunions. Thank you so much for your fantastic website and detailed reviews. While I absolutlely love the Sayonara’s, using them as an everyday trainer like I have been the last two months was beating me up a bit too much especially while putting in base miles over the winter. Based on your stellar review of the Pegasus 31 I went with those. You were spot on. I warmed up 20 minutes on the soccer field in my Sayonaras then hit the bark in the Pegasus for 5 miles. They were a little slippy and less grippy on the wet bark which is fine, good for training, but boy did I love the extra cushioning. The overall ride felt very similar to the Sayonaras and they didn’t mess with my gait. Something I didn’t expect was how much they encouraged a mid/forefoot strike even towards then end when I was getting tired. That is still a mystery to me as to how or why but a great feature. Once I finished I put the Sayonaras back on and hit the soccer field for some 100m strides. Whoa, it confirmed how much they’ve been beating me up especially the calves. Put the Nikes back on and much better. Also going to try a variety of Adidas soon as they show up. I have a pair of Adios Boost I used last year but only on the track. Thanks again! Oh and BTW I also tried the Saucony Ride 7. I know you loved them but they felt rather old school to me. Short in the toe box & too high off the ground. The Nike pegasus 31 are really good shoes, they really surprised me. They feel light and responsive while being comfortable on long easy runs. I just bought the Sayonara 2, so these are my current shoes on rotation. The above statement is from your review of the WR18. Would the Sayonara have the same issue after 100+ miles or would it fair better ? After approx. 100 miles in the WR17, the EVA became a sponge and was much too soft and non-supportive. Note: I posted in the Vomero 10 review for a rec for a shoe with firm cushioning. Mizuno is good except for the durability. And I hesitate to compromise with the weight of the Creation. You did give me good recs with the Ride, Triumph ISO, and UA Gemini, but just exploring. Considering that both shoes uses similar foam materials, the outcome on the Sayonara 2 after 100+ miles should be similar. This is what people misconstrue as a ‘Mizuno break-in’, the degradation of EVA foam which makes it feel more cushioned after mile 40 or so. Im done with mizuno, I got the sayonara 1 when it was released and within 2 months of having it (not really running with it that much since i prefer it to be used as a casual shoes because it looks so good) and the upper shows premature wear already. see those little square pattern on the upper? they will start deteriorate near the forefoot where the shoe bends. Thanks for the feedback – do you have a picture you can upload to this comment box? sure, I’ll update you tonight. im adding the sole just to show that the shoeis not used that much or abused. The high resolutions are helpful, thank you. Mizuno should be giving you a replacement for these, the shoe looks low mileage given the wear on the medial forefoot DSP part. Once out of North America, running shoe customers get a raw deal, and no one gives a damn. People in the US have no idea how good they have it.